Yet who can deny the progress? It is easy to identify the many “goods” we attribute to Enlightenment thinking – the acceleration of trade and the drastic improvements in the economic standard of living. Political concepts such as classical liberalism are developed, and therefore – we believe – our freedoms. An attack not only on tyrannical authority, but also on guilds, associations, universities, and especially Christianity – every intermediating institution that provided decentralization in governance and stood against the monopoly authority of a centralizing state; every intermediating institution that Robert Nisbet suggests offered the individual room and cover for his freedom. 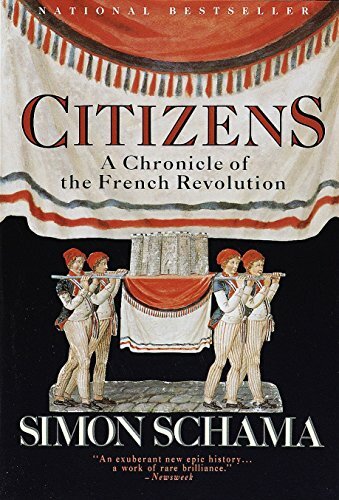 Simon Schama offers that such an attack on intermediating institutions was welcomed by the elite; the people – powerless without these intermediating institutions or the king to turn to – saw it another way. This era was born after the fall of Rome; Germanic tribes mixed with Christianity to create a culture that valued Christian ethics and German honor, resulting in what Fritz Kern describes as the old and good law; law of custom and good tradition. A man’s oath made his law. Any noble could veto the king if he could demonstrate his right in the old and good law. A law regime about as libertarian as has ever existed for an extended period in the west – and even the world. Drop the ritual and prayers, ignore the priests and monks. “Wipe out the disgrace!” Voltaire said of the Roman Catholic Church. Voltaire – “the Enlightenment illuminated” according to Schama – did his part to make this so, through a series of four and five page pamphlets, consolidated into A Portable Philosophic Dictionary. Who needs 1700 years of scholarship and tradition to shape your philosophy when you can have a portable dictionary? No more of this God of the Bible; Deism became the religion of “reasonable” men. God did create the universe, but the story of Genesis is a fable. God did set the rules – the laws of science; He has no reason to interfere thereafter. Jesus? Sure, He was a wise and good man; but out with the Virgin Birth and the Resurrection. “Where has God gone?” [Nietzsche’s madman] cried. “I shall tell you. We have killed him – you and I. We are his murderers. …Whither are we moving now? …Are we not perpetually falling? Backward, sideward, forward, in all directions? Is there any up or down left? Are we not straying as through an infinite nothing? Well, we do have Hoppe and his argumentation ethics. But not so fast! From his radio broadcasts during World War Two, CS Lewis offers that two people properly argue on the basis of some standard. Frank van Dun offered a similar comment at last year’s Property and Freedom Society conference. To summarize: argumentation ethics is constantly appealing to the other person’s conscience – the things we already share; literally, common knowledge. But the ideas of the Enlightenment – Liberty, Equality, the individual, patriotism, and Progress – are all abstract ideas, large buckets that can be filled with a wide variety of contents. We complain that these terms don’t have the meaning that we intend, or the meaning as originally intended – just as socialists complain the same thing. Who is to say how and with what these buckets should be filled? Based on what foundation? Based on whose reason? Without a common conscience, who – or what – will arbitrate? Voltaire has said “commonsense is not so common.” Well, without sense that is common, on what basis do we live peacefully – in a state of conviviality, as van Dun puts it? The Great War – perhaps alone among all substantial human conflicts – remains almost unexplainable. Why and how could such a thing have happened when and where it did – in this “beautiful era,” among the enlightened people? Aleksandr Solzhenitsyn offered an answer: “Men have forgotten God.” Nietzsche’s madman would agree. War became total war, in large part driven by another gift of the Enlightenment, modern democracy. While Lincoln established the precedent fifty years earlier, it was finally in the Great War when war of all against all became generally accepted throughout and within Europe, an event for the nation and not merely the combatants – an “Advance to Barbarism,” as offered by FJP Veale. Poison gas, air raids over civilian populations, submarines destroying ships regardless of flag or purpose, the blockade of civilian food and supplies, even peace not leading to relief. This new liberal now had nothing standing between him and the individual – all intermediating institutions, especially Christianity and the Church, had been stripped of any meaningful role. Each individual was standing naked, to be molded like clay by these progressive, enlightened, “reasonable” intellectuals. Legislation would solve every problem in life. Every need and want would be met, all bestowed via government largesse. Barzun describes these naked individuals as impotent: the receivers of benefits, victims, lacking room to breathe, oppressed by his fellows and the state alike. This naked individual now had but one objective: the Unconditioned Life – emancipation from the realities of this world; nothing to stand in the way of every wish; expecting no rebuffs. Life with no conditions; anything goes, and you can’t stop me. My pleasure is my highest priority; the highest goal in life is to be happy. Enlightened man, like his forefathers after the flood who attempted to build a tower to heaven in order to be like God, found – as Paul VanderKlay says – that when you try to bring heaven down to earth, you bring hell up with it. We need not even look to the “isms” of interwar Russia, Italy, or Germany for examples of this; it is sufficient to look to the social justice liberalism and grievance studies curriculum of America today. 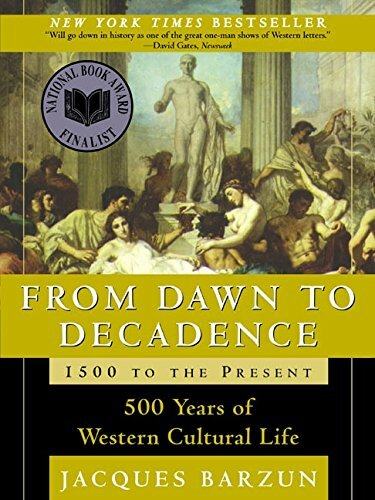 Barzun concludes his magnum opus with a listing of the decadence found in the west over the last century; man’s liberation from all norms, traditions, and customs; nothing left to provide governance except the state – and a state happy to oblige. This was an individual who found his freedom within the cultural and religious context of the time, free to live according to and within this tradition. This individual found and was able to maintain his freedom via the many intermediating institutions of the time – most importantly the Church, which could stand against the king. Meanwhile the state pushes further division – ever-more individualized individuals. The state encourages and subsidizes culture-destroying behavior, as absent governance provided by custom and tradition, governance will be provided by the state. Further, Alexandr Solzhenitsyn, from his Harvard University commencement address in 1978. Having lived under a communist regime his whole life, he understood that a society without an objective legal scale is a terrible one, but a society with only an objective legal scale is as well. In such a society, man has been given freedom for good and evil – and such a society has no defense against the decadent abyss. Nietzsche offered the consequences of killing God in “Twilight of the Idols”: despite the wishes of many Enlightenment thinkers – the “English Flatheads” as he describes them – when one gives up the Christian faith one also loses the right to Christian morality. What is this moral Christian “right” if not, at minimum, the non-aggression principle? This is what man has given up in the Enlightenment. We have traded Christian morality – and therefore our liberty – for the enlightened super-man’s reasonable right to decide what is moral. Hans Hoppe has made it acceptable, at least in these circles, for me to cite as foundational for liberty the Decalogue – certainly the portion of it that related to man’s relationship to man: honor your father and mother; do not murder, do not commit adultery, steal, or bear false witness; do not covet your neighbor’s wife or his possessions. Jesus answered this question. We read in John chapter 8 of the Pharisees bringing to Jesus a woman caught in adultery – certainly not an offense that libertarians would view as rising to the level deserving of physical punishment. The law commanded stoning for such an offense. The Pharisees asked Jesus what should be done with this woman. Daniel Ajamian is a private consultant, currently serving as Chairman of the Board of Directors for two companies; he also is a board member of the Mises Institute.